Money tree plant care is easy. Just put it where it'll get some indirect sunlight. Water thoroughly and allow the soil to dry out a bit between waterings. Cut back on water in the winter when growth slows. Use a container with drainage holes and take care not to overwater your plant because it can get root rot. Its thin trunks are often braided by growers to add to its appeal. Each spoke-like leaf has 5-7 bright-green leaflets. Don't overpot. Use a smallish container because a too-big container will hold too much water. Soggy potting mix is often the biggest problem with this plant, causing stem and root rot and yellowing/dropping leaves. Growing money tree in a small container will also prevent it from getting too big. In fact, this tree can be grown as a bonsai. Regular pruning will also help control its size. Pinch or prune off growing tips. Give it a winter rest. Keep your money tree warm and in bright light year-round. But cut back on water and stop fertilizing in the winter months because growth slows down with lower light levels. Brown, crispy leaves is a symptom of dry air or low light levels. Plants often are in shock when moved to a new home because they are adjusting to a new environment. Keep your plant away from heat/AC vents and cold drafts from windows or doorways. Dropped leaves are also caused by relocation shock. If your new tree drops its leaves, don't give up on it. They'll grow back with good care. Place your money tree in a bright location and leave it there. Increasing humidity around the plant can help. While it's tempting to overwater a shedding plant, don't. It only makes the problem worse. According to feng shui, money tree will bring good luck and fortune. No, your money tree plant won't actually grow currency, but it is a good investment. Treat it well, and you'll enjoy this delightful tree for many years. 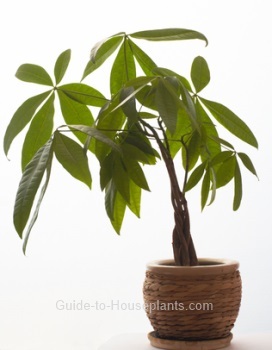 Light: Find a bright spot for your money tree, out of direct sunlight, which can scorch its leaves. It thrives under fluorescent light, making this small tree an ideal office plant. Propagation: Seeds or stem tips. Take stem tip cuttings in spring, with at least 2 leaf nodes attached. Dip the cut end in rooting hormone powder then place it in moist potting mix. Be patient -- it can take several weeks to root.